To see a list of wholesale distributors, click here. 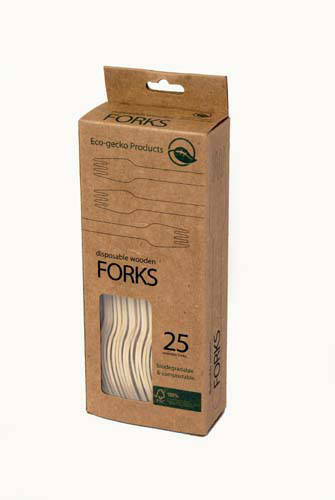 Eco-gecko disposable wooden forks are not only beautiful,they are also completely functional. 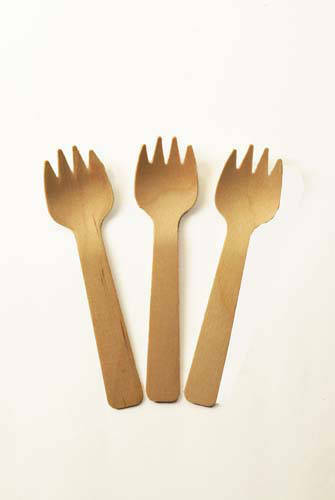 These disposable wooden forks are very sturdy which allows them to handle salads and meats with ease. And unlike many PLA-based products, our wooden forks work well with hot or cold foods. 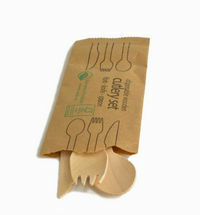 Wooden forks by Eco-gecko are 100% natural and are made of birch wood in a process that does not use any chemicals. Only hot water is used to soften the wood when forming the cutlery and for sterilizing purposes. Therefore, there are no coatings, waxes, or toxins of any sort added to our naturally beautiful tableware. 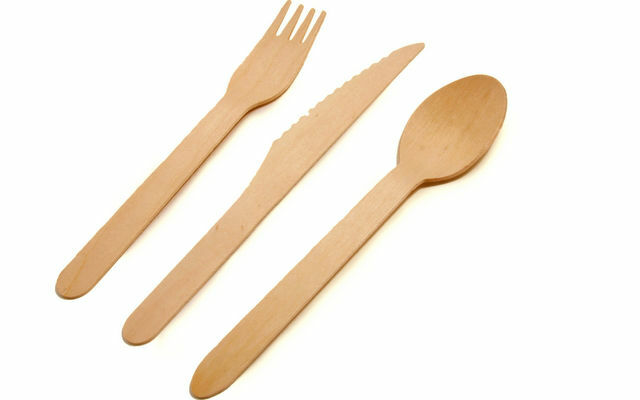 These disposable wooden forks and all of our disposable dinner utensils and wooden cutlery are readily accepted at composting facilities on the basis of being composed of completely organic material. Even more reasons to choose Eco-gecko for disposable cutlery in your office lunchroom or for your next event. 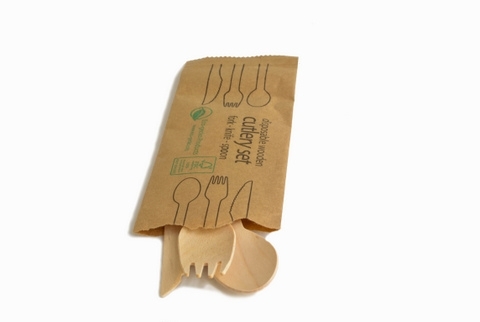 All of our disposable wooden cutlery are made from FSC®-certified birch wood. This means that the FSC (Forest Stewardship Council) recognizes and certifies that the methods of harvesting and re-planting are being managed sustainably. So you can feel good knowing that you are using renewable resources wisely. 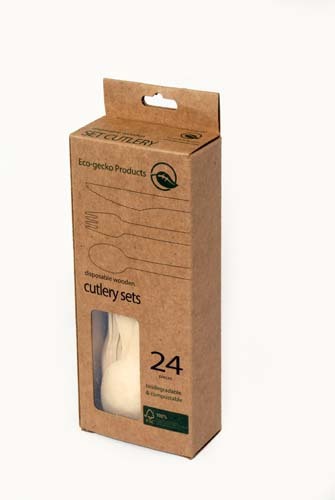 Our 6 ½ inch compostable wooden forks come in bulk packaging as well as in 100-packs in brown paper canisters. 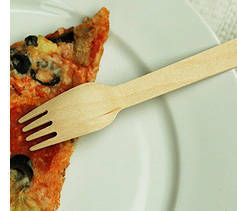 We also offer disposable wooden forks with customized logos, customized packaging, in a wide variety of shapes and sizes. 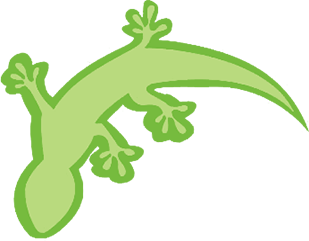 If you have any questions about Eco-gecko biodegradable and compostable wooden cutlery or our disposable palm leaf plates and bowls, you can check out our FAQ page, or get more information by contacting our helpful staff now.